These cookies are a litmus test: if you grew up with an Italian grandmother, you’re probably nodding your head like “oh, yeah pizzelles”. But if you didn’t have the privilege, you are probably squinting at these pictures trying to figure out how I got my waffles so thin. Or maybe you know what pizzelles are, but you never knew the name for them. Either way, come on in, take a seat, and allow me to offer you a stack of these crispy, light, and terrifically addictive cookies. 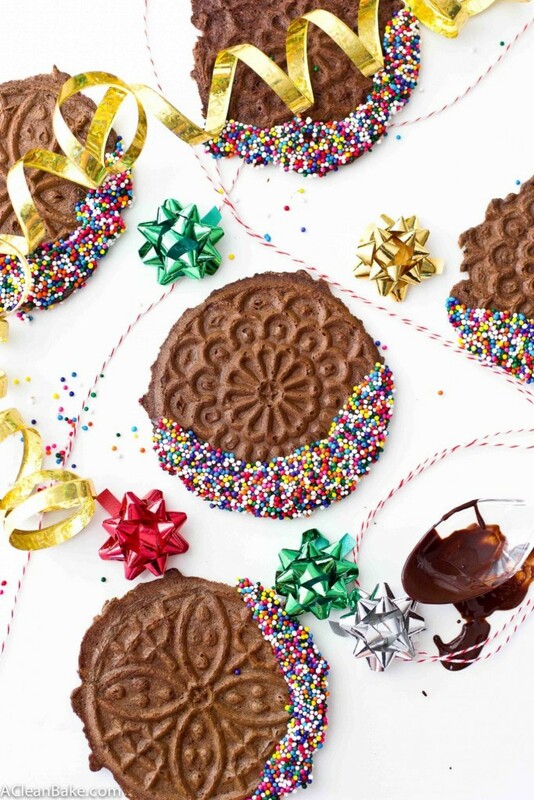 Though not technically a holiday-only cookie (they’re pretty perfect any time of the year), the slathering of extra chocolate and burst of festive confetti sprinkles on these grain free chocolate pizzelles just screams to be served at a festive holiday gathering, don’t you think? I made these as part of Simple Mills’s 12 Days of Cookies celebration, and the theme of Day 4 (that’s today!) is Life of the Party. Can you imagine the reactions you’d get when you show up with a platter of these? They are pretty and celebratory, and so much fun to eat. That’s probably my favorite thing about the holidays: so many opportunities to share food with people who make your life awesome. You already know that I jump at the opportunity to feed my friends, and I go a little (more) overboard during the holidays, especially when it comes to dessert, and double especially when it comes to cookies! I don’t know if I am the life of the party (of if I am, it wouldn’t be very humble to admit it, would it? ), but – modesty be damned – my cookies sure are. It’s not a holiday party until someone shows up with a huge platter of homemade cookies. That’s just the truth! And, since it’s the holidays, why not bring or give (did I mention these make excellent hostess gifts, too?) something a little special? These grain free chocolate pizzelles only look fancy, but they get their ornate shape from a special pizzelle press that looks similar to a waffle iron, but the space between the plates is much thinner. Unlike drop cookies, you make them on the iron only a few at a time – which is why I like the smaller size iron, which makes 4 cookies at a time instead of 2 larger ones; this is pretty close to the one I use – but they only cook for a few minutes a batch, so please don’t be turned off by that. The unbelievably easy batter makes up for it. 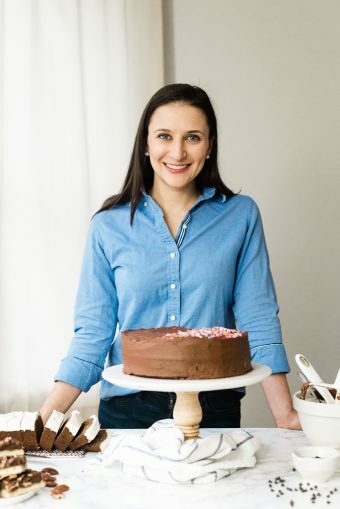 It’s made with Simple Mills Chocolate Muffin Mix and a few other standard ingredients and it’s all done in just a few stirs. Then, bake ’em, cool ’em, dunk ’em (in chocolate), and dunk ’em again (in sprinkles) and you’re ready to party! So, tell me, how do you celebrate the holidays? Parties? Cookie baking? Tree (or Hanukkah Bush) trimming? Leave me a comment below, and check out Simple Mills’s Life of the Party Pinterest board for more holiday party and gifting inspiration! 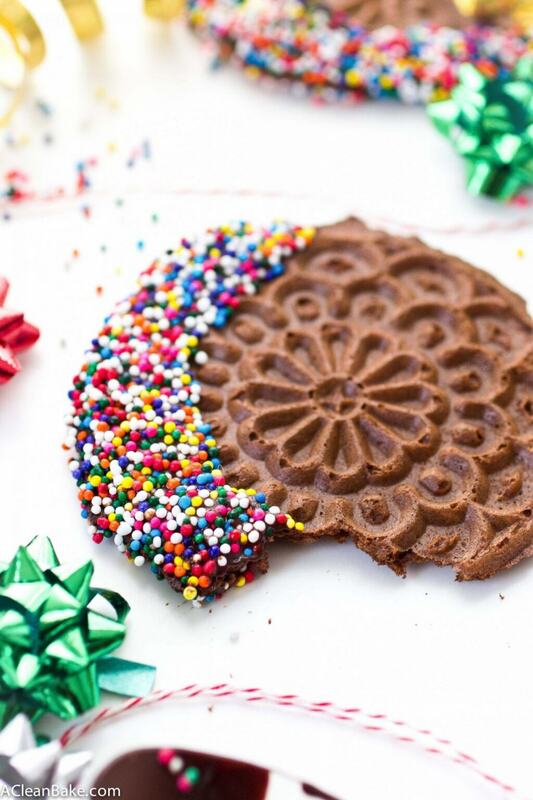 Grain Free Chocolate Pizzelles. These classic Italian cookies are made grain free, gluten free and paleo friendly but stay as crisp and flavorful as ever! In a large mixing bowl, whisk the eggs, then mix in the almond milk and water. Whisk in the Simple Mills mix. Preheat a 3” pizzelle maker (it looks like a very shallow waffle iron). Lightly grease the grills, if necessary – if it’s not nonstick – before dropping heaping teaspoons of batter into each compartment. Close the cover of the machine and bake for approximately 3 minutes until the grill opens easily (the pizzelles won’t stick). Remove the pizzelles from the machine and transfer to a wire cooling rack for a few minutes, until cool and crisp. Once the pizzelles are all cooked and cooled, melt the chocolate in a double boiler or in a heatproof bowl in the microwave (cook in 30-second increments, stirring in between, until completely melted and smooth). Please the sprinkles in a shallow plate or bowl. Swipe each pizzelle firmly through the melted chocolate, and gently shake to remove the excess chocolate. Immediately place the chocolate-dunked side into the sprinkles and return the pizzelle to the cooling rack (or a cookie sheet lined with a nonstick pad or wax paper). Repeat with some more or the rest of the pizzelles. You can make these ahead of time, but don’t chocolate-coat them until the same day that you’re going to serve them. 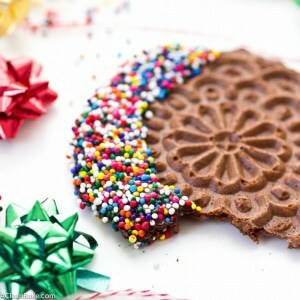 Store un-chocolate-coated pizzelles in a zip top bag with a 1” opening (i.e. don’t fully seal the bag) at room temperature for up to 3 days. If you don’t have the patience to dunk each individual pizzelle, lay them out in a single layer and drizzle the chocolate over them. Medha, the previous commentator…….. not only the design is lovely but also seems too delicious…… Thanks for this one. I am definitely going to try this at home tonight. I’ve always been enamored by the intricate design of pizzelles…if only I could own one of those pizzelle-making machines! Yours look beautiful and I love the festive sprinkles (: It’s true, cookies bring the life to the holiday party! You should get one! They’re the ultimate unitasker (Alton Brown would not approve) but they are so much fun to use and the cookies are SO much fun to eat! I would suggest using the entire bag of mix to get a more traditional batter. When I used one cup, the batter was incredibly thin and runny. Too messy for the iron. I made chocolate pizzelle and then vanilla pizzelle using the vanilla version of the mix. Are you using a pizzelle machine or a waffle machine? If it’s a traditional pizzelle machine, you do want a fairly runny batter.